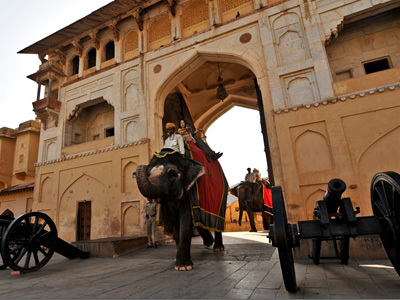 The tour offers a glimpse of the royalty, tradition & style of the erstwhile Maharajas. You will stay in many of these palaces now converted into hotels. 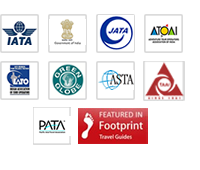 Combines with the magnificent Taj Mahal & the Pink city of Jaipur. 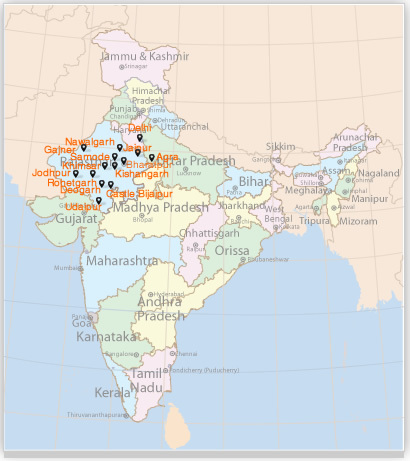 Nawalgarh is a town of Jhunjhunu district in Rajasthan, India. It is part of the Shekhawati region. It is midway between Jhunjhunu and Sikar.It is 30 kilometers far from Sikar and 39 kilometers far from Jhunjhunu. Nawalgarh is located at 27°51' North, 75°18' East. Nawalgarh is famous for grand havelis with frescos, which is specialty of the Shekhawati region. It has some of the best-preserved havelis and finest frescoes in Shekhawati. Visit to Nawalgarh Fort (Bala Kila Fort) built by Thakur Nawal Singh. Founded in 1737 AD but today it stands largely disfigured by the modern accretions. Now it houses two banks and a few government offices. 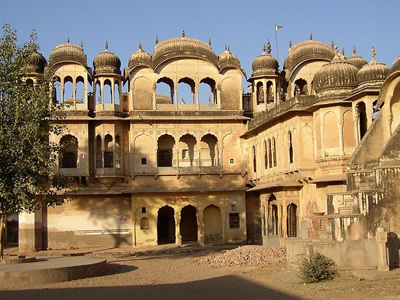 Roop Niwas Palace about one km from the Nawalgarh fort is the salubrious Roop Niwas Palace. 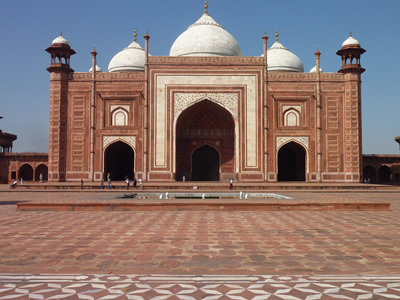 Built by Thakur Roop Singh Ji and Rawal Madan Singh Ji. The palace is enchanting with a well-laid garden and fountains. Anandi Lal Podar Haveli this haveli, built in the 1920s, houses a school, but has many fine paintings. Sheesh Mahal it is an astounding building with a ceiling mural that includes maps of Nawalgarh and Jaipur. Gajner, a historical town famous for its beautiful fort. En route, visit Fort Junagarh. This unassailable fortress was built in 1593.You will also visit the Ganga Jubli museum that contains archaeological exhibits as well as royal memorabilia. 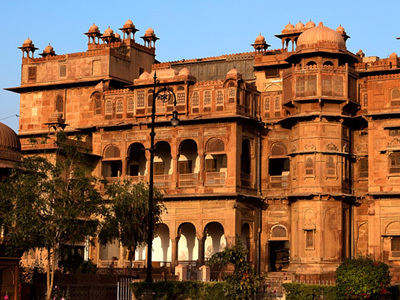 Visit Gajner Palace(Hunting Lodge of Maharaja Bikaner) followed by visit to Gajner Lake and the Gajner Wildlife Sanctuary, one may see wild boars, blue bulls, chinkaras and black bugs. Gajner is the Mecca and paradise for people who love bird watching. The bird watchers will be able to catch a glimpse of many colorful and rare birds. Gajner is 30 km from Bikaner in the Thar Desert. 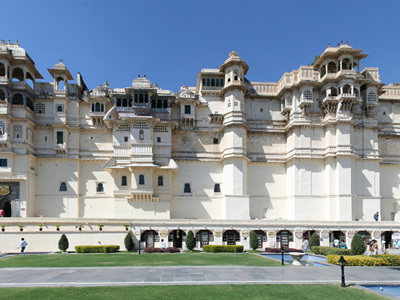 It is famous for its 6, 000-acre red sandstone palace built by Maharaja Ganga Singhji of Bikaner. It is located on the banks of a picturesque lake rich with a variety of wildlife and vegetation. Built as a hunting lodge and summer resort in early 20th century, the Gajner Lake attracts migratory birds in winters, and animals like nilgais, chinkaras and deer. Gajner has the only Camel breeding farm in Asia where you can experience farm life at close quarters in the afternoons when it is open to the public. You can also go on camel safaris on the sand dunes. Gajner Wildlife Sanctuary is home to a variety of wild animals and birds. Khimsar is situated in district Nagaur of Rajasthan. 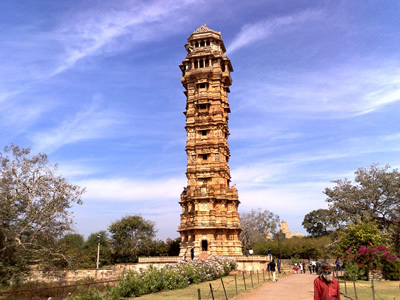 Khimsar is located in the middle of a small village, just off the Jodhpur. Khimsar is the small township of Khimsar. Khimsar was once a small kingdom. The construction of the fort initially began in 1523 but the family moved in to the fort only during the 18th century. Thakur Onkar Singh, the present occupant of the fort, built a regal wing for himself in 1940s. The pride of Khimsar today is still that fort, 450 years old and currently home to the 18th, 19th, and 20th generations of the Khimsar thakurs. In the evening enjoy camel safari and horse riding. Cultural programmes like folk dance and music are other exciting activities. 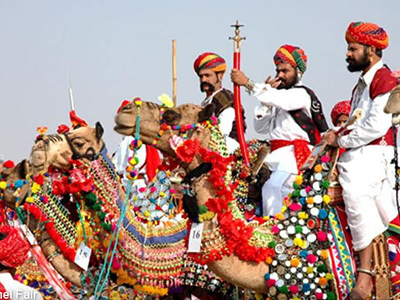 Take an excursion to villages of Bishnoi community and watch their unique desert life, so close to the nature. Rohetgarh Fort is the bastion of the chivalrous Champawat clan of Rathores. 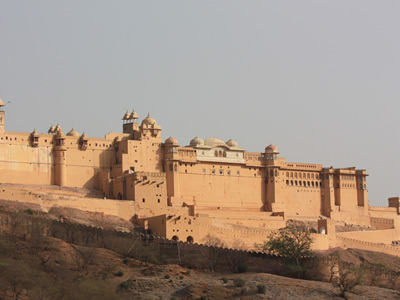 Even though this fort is one of the lesser known forts of Rajasthan, its architectural marvel and exquisite carvings and paintings speak volumes about the beauty of the citadel. The Rohetgarh Fort was presented as a gift to Thakur Dalpat Singh I in 1622 AD for leading and winning several wars under the banner of the Rathores of Marwar. This fort hotel is a paradise for nature lovers, known for its peaceful haven with well-manicured lawns, where one can easily sight peacocks roaming freely in the fort and the only sound one can hear is the chirping of the birds. Visit the City Palace and museum. A majestic architectural marvel towering over the lake on a hill surrounded by crenelated walls, it is a conglomeration of courtyards, pavilions, terraces, corridors, rooms and hanging gardens. The main entrance is through the triple arched gate, the 'Tripolia' with eight marble porticos. The Maharana were weighed under the gate in the gold, the equivalent amount of which was distributed among the populace. Later visit Saheliyon Ki Badi. This small ornamental garden was a popular relaxing spot where royal ladies came for a stroll and hence the name. The garden has many fountains in its four delightful pools, chiseled kiosks and marble elephants. Day free at leisure in the city of lakes. ChittorgarhThe most Romantic name in Rajasthan is Chittaur. Chittaur is more than a ruined citadel; it is a symbol, It stands for all that was brave, true and noble in the Rajput tradition. 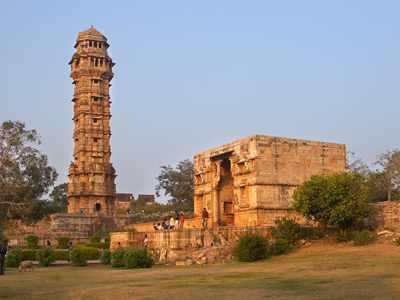 Visit The Fort, Vijay Stambh (Victory Tower), Kirti Stambh (Tower of Fame), Padmini's Palace and many more. Later proceed to Castle Bijaipur. Castle Bijaipur, this 16th century castle set in the serene Vindhyanchal ranges was built by Rao Shakti Singhji the younger brother of the great warrior Maharana Pratap. This fort echoes the sounds of many fierce battles of historic importance fought against Mughals and marathas. A wildlife sanctuary adjacent to the castle has leopard, Chinkara, spotted and four-horned deer, crocodile and wild boar as well as a variety of birds. Jeep and camel safaris, trekking and camping. 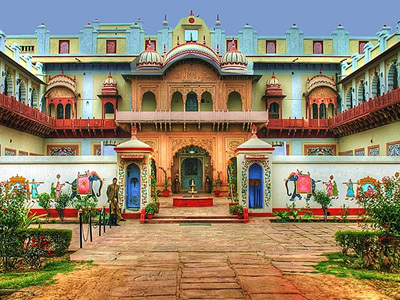 Drive to explore the Deogarh Palace with five floors and over 200 rooms which have murals done by local painters after whom Deogarh school of painting has acquired fame the world over. Also visit the famous school of miniature painting and some of the loveliest Deogarh miniatures adorn the personal collection of the present Rawat Sahib. You may also Pick-up and ride in Vintage Cars owned by the Royal Family. Morning drive to Kishangarh via Pushkar. 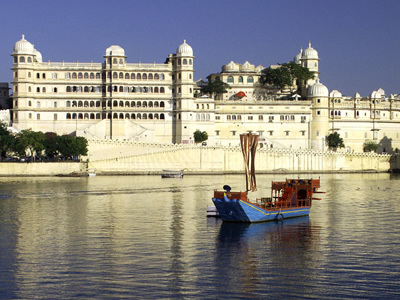 Visit the holy ghats of Pushkar and the Brahma Temple. Arrive Kishangarh. 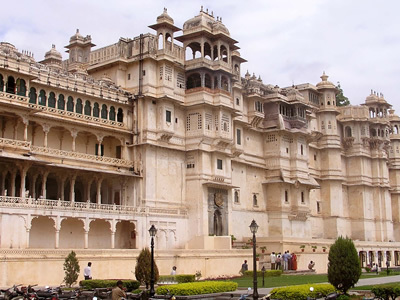 Visit Phool Mahal Palace constructed in the 19th century by Maharaja Prithee Singh as his palace of the lotuses. The majestic fort of Kishangarh and the deep moat surrounding it, forms its backdrop while the vast Gundalao Lake with its myriad bird life its front. Drive to Delhi for onward destination.